Welcome to our EDDM Client of the Week – Magson Real Estate. The NYC-based real estate firm, Magson Real Estate, contacted ummhumm | creative studio to create a visually compelling and unique-sized EDDM, or Every Door Direct Mail®, mailer for their neighborhood in Queens, NY. The first choice of a standard, two-sided postcard was tossed aside due to Magson wanting a very unique design that really cut through the noise of junk mail. NYC residents have seen it all, so we set upon coming up with a product that would articulate Magson’s request. Utilizing our partnership with EDDM2go, we decided on using their 11 x 17 product that folded down to 8.5 x 11. The size was perfect because it provided enough space, or real estate, to accurately and effectively display Magson’s message. Designed to highlight the company’s many-faceted services, the mailer turned into door hangers for other neighborhoods throughout Queens, Brooklyn and Manhattan. We kept the branding consistent across both printed pieces that echoed the website in look and feel. 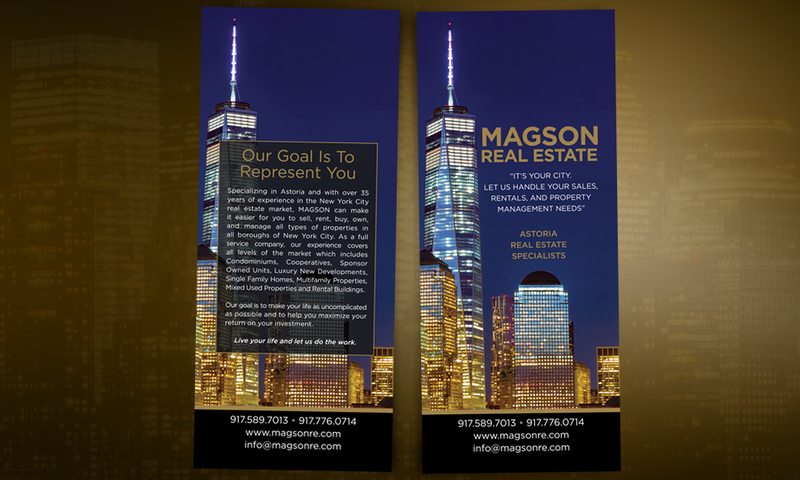 Focusing on Brokerage and Management services, the mailer helped Magson Real Estate educate potential clients, as well as gain a foothold in the crowded NYC real estate market. 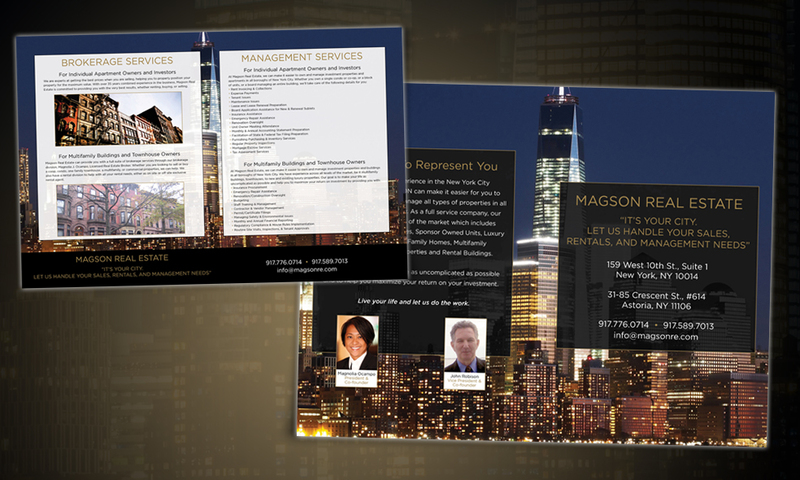 Should you find yourself renting, selling, buying or in need of real estate management services in NYC, check out Magson Real Estate. With over 35 years of experience in the New York real estate market, MAGSON can make it easier to sell, rent, buy, own,and manage all types of properties in all boroughs of New York City. As a full service company, our experience covers all levels of the market which includes Condominiums, Cooperatives, Sponsor Owned Units, Luxury New Developments, Single Family Homes, Multifamily Properties, Mixed Use Properties, and Rental Buildings. Our goal is to make your life as uncomplicated as possible and help you to maximize your return on investment.